Download "CURRICULUM VITA OF. Jackie B. Rogers, Ph.D., C.R.C. Educational Psychology, University of Kentucky. Rehabilitation Counseling, University of Kentucky"
2 Medical and Psychological Aspects of Disability II Rehabilitation in Business and Industry Counseling Theories and Techniques I Supported Employment and Independent Living Vocational Evaluation and Work Adjustment Job Placement Services and Techniques in Rehabilitation Counseling Practicum in Rehabilitation Counseling Internship in Rehabilitation Counseling Publications and Research Rogers, J. B., Bishop, M., & Crystal, R.M. (2005). Predicting rehabilitation outcome for Supplemental Security Income and Social Security Disability Income beneficiaries: Implications for consideration with the Ticket to Work Program. 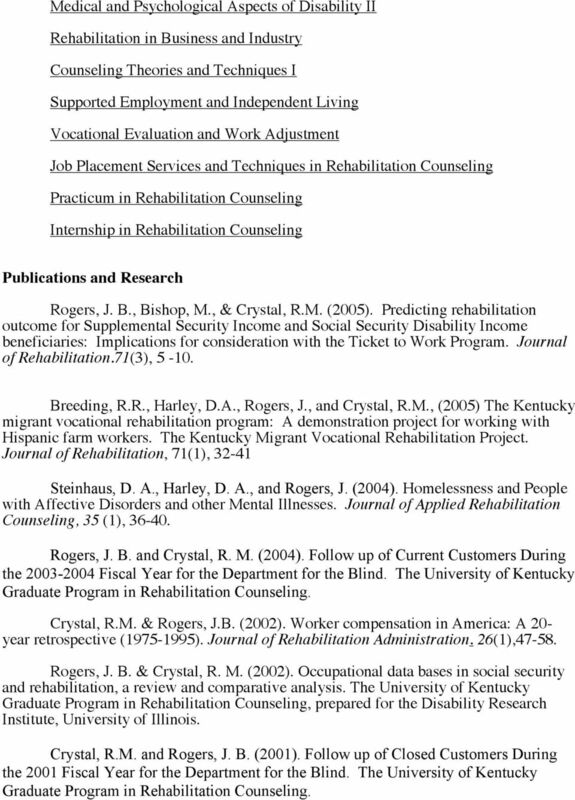 Journal of Rehabilitation.71(3), Breeding, R.R., Harley, D.A., Rogers, J., and Crystal, R.M., (2005) The Kentucky migrant vocational rehabilitation program: A demonstration project for working with Hispanic farm workers. The Kentucky Migrant Vocational Rehabilitation Project. Journal of Rehabilitation, 71(1), Steinhaus, D. A., Harley, D. A., and Rogers, J. (2004). Homelessness and People with Affective Disorders and other Mental Illnesses. Journal of Applied Rehabilitation Counseling, 35 (1), Rogers, J. B. and Crystal, R. M. (2004). Follow up of Current Customers During the Fiscal Year for the Department for the Blind. 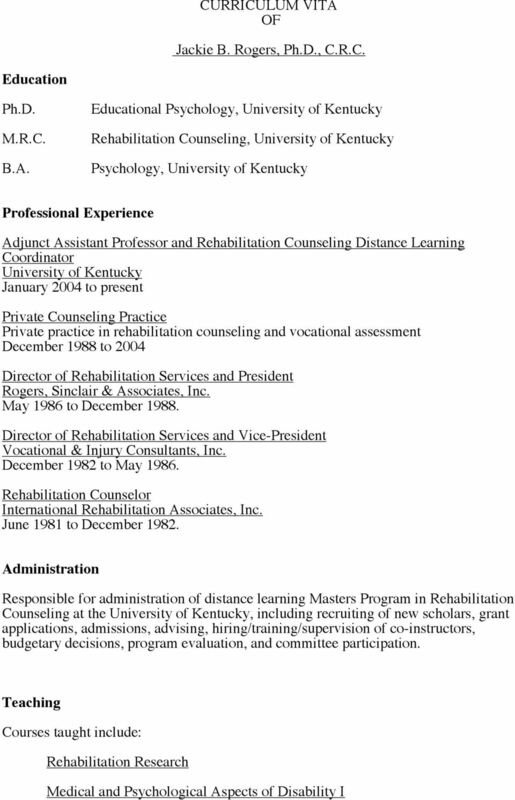 The University of Kentucky Graduate Program in Rehabilitation Counseling. Crystal, R.M. & Rogers, J.B. (2002). Worker compensation in America: A 20- year retrospective ( ). Journal of Rehabilitation Administration. 26(1), Rogers, J. B. & Crystal, R. M. (2002). Occupational data bases in social security and rehabilitation, a review and comparative analysis. The University of Kentucky Graduate Program in Rehabilitation Counseling, prepared for the Disability Research Institute, University of Illinois. Crystal, R.M. and Rogers, J. B. (2001). Follow up of Closed Customers During the 2001 Fiscal Year for the Department for the Blind. The University of Kentucky Graduate Program in Rehabilitation Counseling. 3 Rogers, J.B. (2000). The potential for clinical bias in vocational expert testimony. 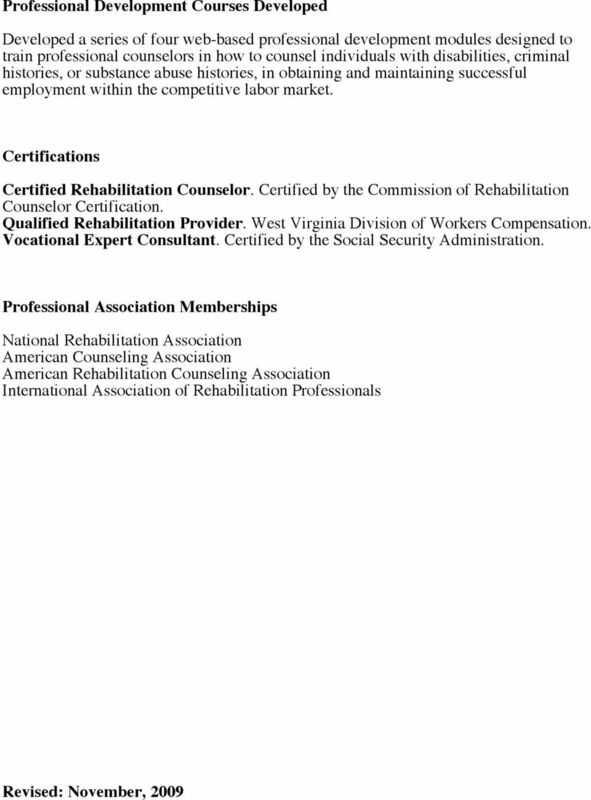 Rehabilitation Professional, 8 (5), Service Served as member of OWL Professional Services Committee (2009 to present). Grants Office of Special Education and Rehabilitative Services, "A Long Term Rehabilitation Counselor Education Training Program: Comprehensive System for Personnel Development." Awarded September, 2009 August Total award: $999,995. Author and Principal Investigator Office of Special Education and Rehabilitative Services, "A Long Term Rehabilitation Counselor Education Training Program: Comprehensive System for Personnel Development." Awarded September, 2005 August Total award: $993,000. 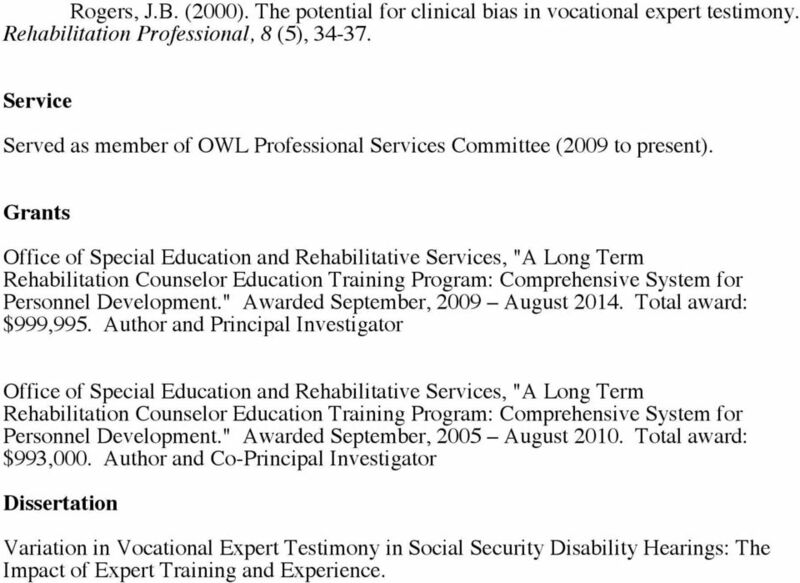 Author and Co-Principal Investigator Dissertation Variation in Vocational Expert Testimony in Social Security Disability Hearings: The Impact of Expert Training and Experience. 4 Workshops Conducted The impact of specific mental and physical characteristics upon an individual s functioning in society. Seminar on representing disabled claimants in Social Security disability hearings. Sponsored by the Appalachian Research Defense Fund, Rehabilitation services for the disabled worker. Seminar on workers compensation. Sponsored by Ferrari & Fogle, The counselor as a vocational expert. Kentucky Rehabilitation Association seminar, In-service Training Seminars Conducted Provided in-service training to vocational counselors regarding the following topics: Job placement Orientation to providing vocational rehabilitation and adjustment counseling services to injured workers Medical and vocational aspects of disability Rehabilitation case management techniques Presentations: Perspectives on job placement: Consumer and employer advocacy. Goodwill Conference, The status of distance learning in rehabilitation counseling. 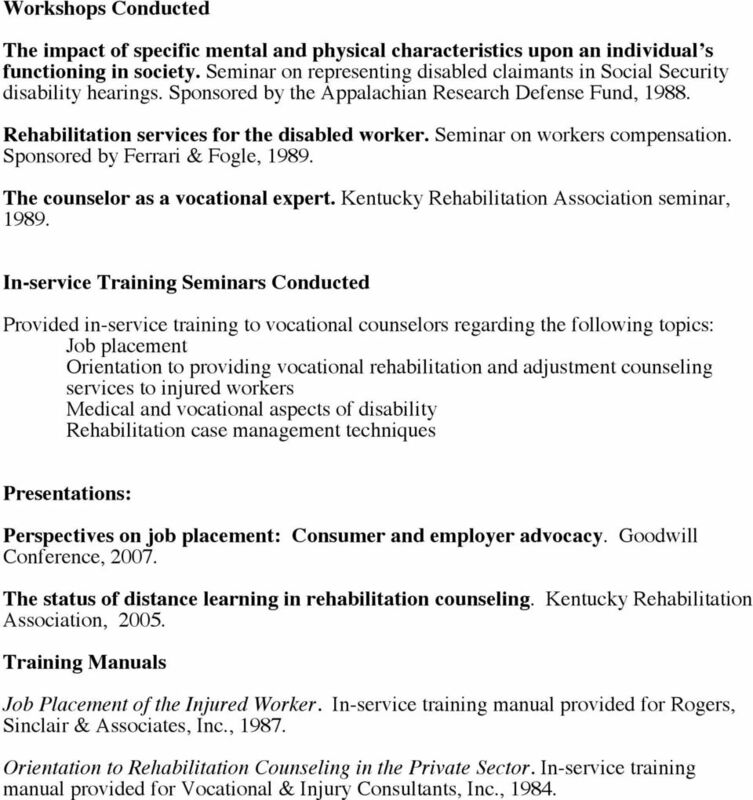 Kentucky Rehabilitation Association, Training Manuals Job Placement of the Injured Worker. In-service training manual provided for Rogers, Sinclair & Associates, Inc., Orientation to Rehabilitation Counseling in the Private Sector. In-service training manual provided for Vocational & Injury Consultants, Inc., 1984. VITAE Jennifer W. Walken, Ed.D.